Thomas Mallon is back at No. 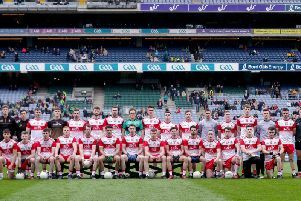 1 as Derry make the trip to Portlaoise this weekend. Damian Barton has named four changes to the team defeated by Tyrone as Derry seek to bounce back against Laois in Portlaoise on Sunday. “We have a massive game with Laois, we’ll go down with major intentions of winning and hopefully we can defeat Laois and get ourselves back in the chasing pack again. Thomas Mallon returns in goals after the Oak Leafers struggled with their own kick-outs last week though Eoin McNicholl was not helped by a distinct lack of movement from the men in front of him in Healy Park. Benny Heron comes in for Mark Craig and, along with Sean Leo McGoldrick, will be expected to supplement the half-back line and carry ball forward to an attacking unit that shows two changes from last week. Ryan Bell, one of Derry’s outstanding performers so far this season, is rested meaning a chance for Slaughtneil’s Christopher Bradley who scored two points and did well off the bench against the Red Hands. The other change to the forwards sees Shane Heavron replace James Kielt and form what looks a Magherafelt front two with Emmet McGuckin who will hoping to get more service than he did last week. Mark Lynch is again among the substitutes as a precaution after hurting his hamstring before the Tyrone game. With Barton still serving a suspension, assistant manager Brian McGuckin will again be in charge along the line and he stressed the need for Derry to get back to winning ways after successive defeats. “The two-week break hasn’t been good for us,” conceded McGuckin, “Hindsight’s a wonderful thing but we’ve had two defeats since the break so we’re going to have to sit down and reassess. The implications of both victory or defeat is massive for both teams on Sunday. Mick Lillis’ men are currently second from bottom after one win from their four games but such are the small margins in Division Two that only three points separate them from second placed Galway. Derry are one of three teams - alongside Fermanagh and Cavan who meet in Brewster Park on Saturday evening - that sit on four points with Meath tucked in behind on three and Armagh bottom on two. Victory for Derry could push them back toward the promotion places while defeat would leave them nervously looking over their shoulder. And for Laois defeat would almost certainly see them cut adrift at the bottom with struggling Armagh who face Galway this weekend. Laois lost out to Fermanagh by 10 points last week but had previously been doing reasonably well after a narrow three point defeat against Tyrone followed their solitary win over Armagh in Round Two.